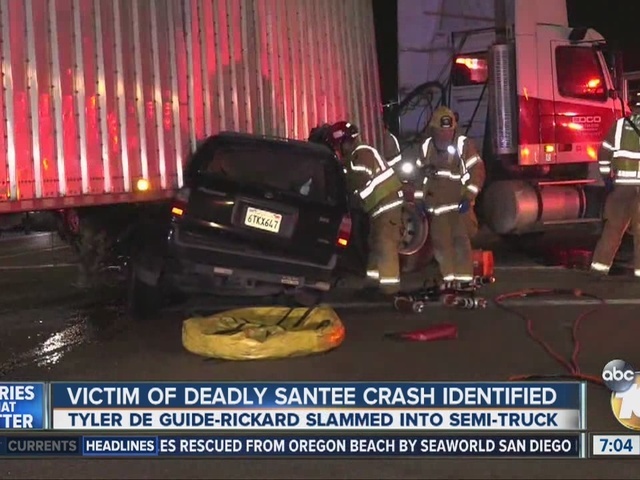 SANTEE, Calif. -- One man was killed after an SUV got wedged underneath a semi-truck in a horrific crash on State Route 52 in Santee early Wednesday morning. The crash occurred at 5:22 a.m. on SR-52 westbound off-ramp at Mast Boulevard. 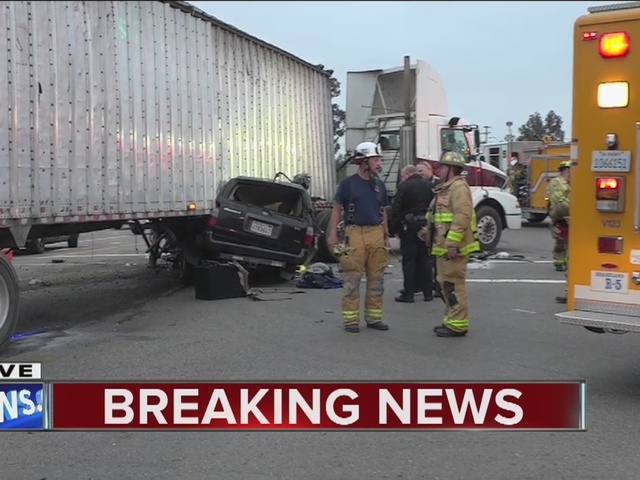 According to San Diego police, a car was speeding off the ramp when it ran a red light and crashed into a semi that was going east on Mast Boulevard. Santee Fire Department crews responded and attempted to rescue the SUV's driver, who was trapped inside. However, he died at the scene. The driver of the semi was not hurt. The deceased driver was identified as Tyler Scott De Guide-Rickard, 23. "It woke up our neighbor as well. We're about a quarter of a mile from where that accident is,” said Jim Southard. Southard's home overlooks the 52 and that intersection where the crash happened. Sky 10 flew overheard just a few minutes after the crash happened. Traffic backed up for miles as police took the next four hours investigating and clearing the intersection. “The speed that he hit him it would have showed. He had to be going pretty quick. No question,” said Southard. Police say the driver was going west on SR-52, when he came speeding down the Mast Boulevard off ramp, ran a red light and slammed into the semi. Rickard’s father arrived at the scene around three and a half hours later. He was visibly heartbroken after police confirmed his 23-year-old son had died. The driver of the truck immediately stopped and called 911. The driver of the SUV lived with his parents in their spring valley home. The medical examiner has not yet determined if he was driving under the influence of any drugs or alcohol.